RDM offers an impressive inventory of lab tables that bring the utmost benefits for users. Each lab table that we manufacture has undergone rigid manufacturing procedures, in order to ensure that they deliver on what our clients need. Combine that with our 37 years experience in the field—plus our dedication to deliver only the best—you can rest assured that you are in good and able hands. Our science lab tables and related furniture pieces are designed with high-grade and durable components—in order to ensure long term use, durability and high quality. RDM’s wood frame tables are significantly more durable and usable compared to the traditional wood frame tables. Our stainless steel tables are made of high-quality steel (with fully welded steel frame connections), assuring users that their tables can actually withstand heavy duty use or other related activities. With our dedication to provide clients with options that can actually cater to their respective needs, we have added new features to our lab bench and table options. These include our adjustable height microscope tables, stainless steel lift tables, laboratory tables w/ upper shelves, modular table frames with suspended laboratory cabinet units, and many other options. 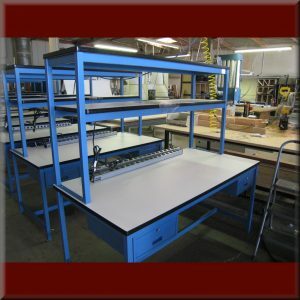 If you have specific lab table features or specifications in mind, then you’d be happy to know that we offer custom-made lab furniture as well. Remember: We are the manufacturer of our products. Hence, whatever you need, just tell us—and we’ll be more than glad to help you out. RDM’s goal is to help provide the needed solutions to our clients’ furniture needs. As it is, you can rest assured that we will not only be providing high-quality laboratory benches that will serve your intended purposes—but those that will actually fit your budget as well. In the end, the choice is all yours. But if you want help—don’t hesitate to give us a call. We’ll be here for you.